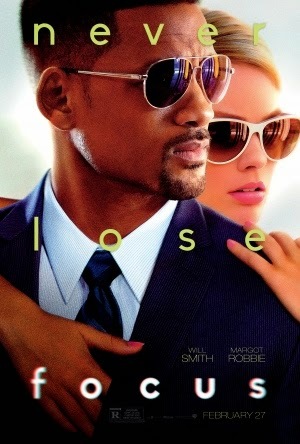 This year's Focus stars Will Smith as con artist Nicky Spurgeon, who encounters an aspiring thief named Jess Barrett (Margot Robbie) and trains her into his business. Once he realises his emotions are getting too close, he dismisses her from the team, only to find her again three years later whilst on a new assignment. They steadily approach a similar scam, and are drawn together once more when their secrecy to their foes is at stake. Focus' first act is beyond exceptional. I love the clever explanation of the psychological crime tactics, and the beautifully constructed scenes that depict these in action. It's got tense moments coupled with humourous ones; all in all, it's a clever, witty, and charming phase of the narrative that keeps you hooked with it's interesting ideas. However, once we move on three years later and enter the middle and final acts, things get a bit (er herm) unfocused. It's very genre confused at times - is this a thriller? A comedy? A romantic drama? It combines elements of them all, which is fine, but not always in the right way; creating jarring tonal shifts at random moments. While this may be a pet peeve of mine, I also find it to be an extremely dated mechanic to have goofy or eccentric characters dropping F bombs or other swear words in every sentence in an attempt to appear funny. The script didn't really know when to stop with moments like this, nor did it know when to stop in terms of plot twists. The endless amount of twists and turns juggle around certain characters and confuse their motivations, and also make way for tons of plot contrivances. Will Smith provides a magnetic performance in the lead role, and is definitely one of the film's finest merits. Robbie plays an equally quirky and likeable supporting role as the love interest / femme fatale figure, though her role also seems to sporadically jump between humourous and dramatically serious. The flare of it's star performances give Focus a charismatic vibe, but in the end it wastes a fantastic premise on the wrong genre conventions. The inherent goofiness and confusing romantic themes don't always fit alongside the stylistic crime ones, and when the film seems to be reaching the heights of an intense thriller, it tanks back down into a silly ordeal. When it's good, it's really good, but this level of quality just isn't consistent enough.